Les Baxter has been officially dubbed 'the founding father of Exotica', and here's a timely reissue of one of his greater works. 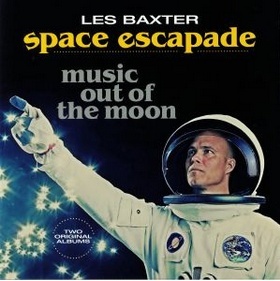 Space Escapade was Baxter's spectacular 1958 piece de resistance, featuring his trademark eclecticism and lush orchestral effects. Also included is Music Out Of The Moon with its six songs originally having seen the light of day as 3 separate shellac '78s in 1947. Bandleader Baxter was joined by composer Harry Revel and Dr Samuel J Hoffman on theremin. Remastered, 180g vinyl LP on Vinyl Passion.